I did something I’m not proud of recently. As someone whose favorite holiday is Thanksgiving, whose birthday falls about a week before that date, and who despises winter, I guard the sanctity of November with my life. November – that fall month when you can show off sweaters unencumbered by heavy jackets; when you’re invited to an enchanting outdoor theater of reds and oranges and yellows; when your plate is never empty and gluttony is always acceptable; and when you can celebrate the people in your life just because, without the pageantry of presents. November is the month I live for and I almost forgot that this year. So what did I do to destroy that? A few weeks ago, I was having a rough go of it with work, meetings, and the general grind. I hadn’t had a second to breathe and things I can’t even remember now were causing me to fret and worry the way we do over silly things when we’re stressed. So what did I do? I pulled out some flour, a fruit I’ve never experimented with and put on Christmas music. Christmas music! I typically refuse anything Christmas-related until Thanksgiving ends, sometimes I won’t even allow it until after the entire autumnal oasis of this eleventh month gets swept away into December. But that day, that particular day, all I wanted was to bake and think of the holidays with my family. My mom had encouraged my foray back into the kitchen, sagely reminding me that I go a little crazy when I haven’t had a chance to smell the rose water. And another mom near and dear to my heart had given me that one extra push, sending me a box of produce fresh from her backyard. The persimmons inside were my trip away for an evening. To the sounds of Michael Buble crooning about bells, Santas, and holy nights, I chopped persimmons, blended butter and flour, and imagined the upcoming holidays with all those I consider family. The persimmon tart turned out lovely that first time – beautiful crust with a thin layer of crispy cinnamon persimmons with just a hint of spice. Unfortunately, when I tried to recreate the tart as a thank you to the gardener on Thanksgiving day, I made a couple mindless mistakes and it turned out much less appetizing. Maybe the Christmas music was a necessary part of the baking process after all. 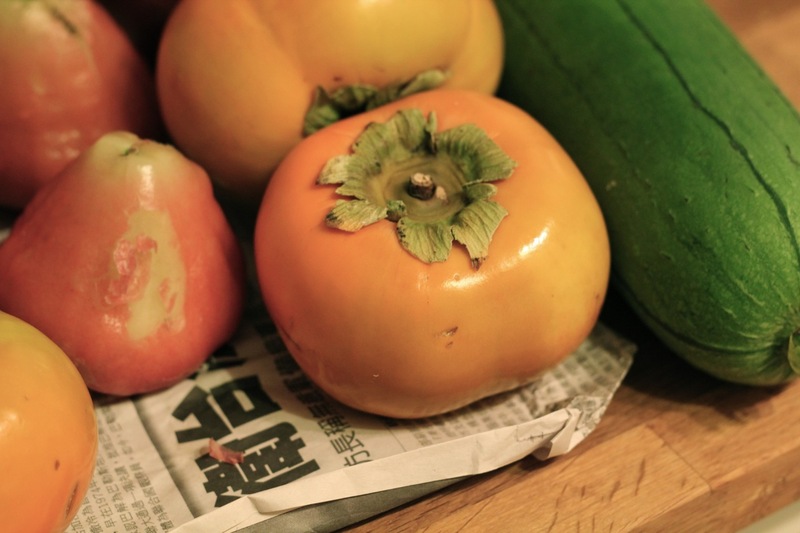 Note: This recipe uses Fuyu persimmons, which are the harder, squatter ones. 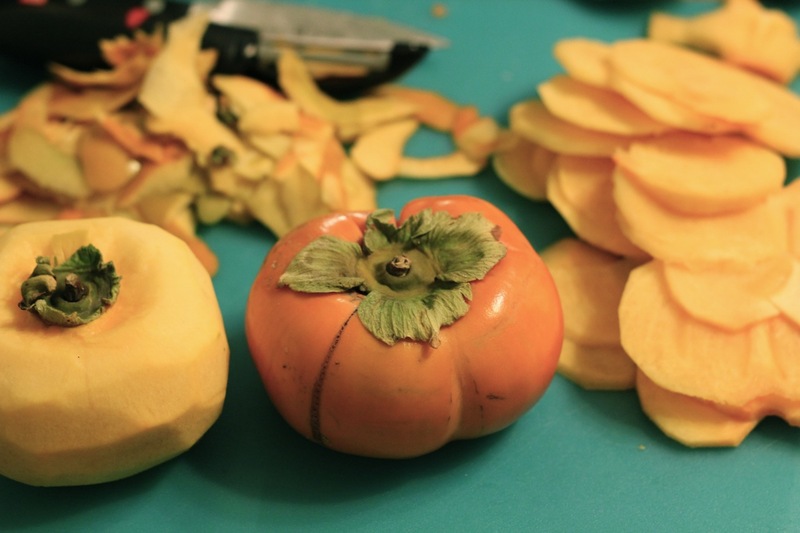 Fuyu persimmons are a little like spicy apples, while Hachiya persimmons are a lot juicier and might require some manipulating to use in this recipe. Make dough: Using a pastry blender or your hands to blend together flour, butter, and salt. Add 2 tablespoons ice water and incorporate. If mixture doesn’t hold together when you squeeze a small handful, add more water a teaspoon at a time. Continue adding ice water until mixture resembles a coarse meal with pea-sized butter lumps. Bring dough together into a large disk and chill, wrapped in plastic, for at least 1 hour. 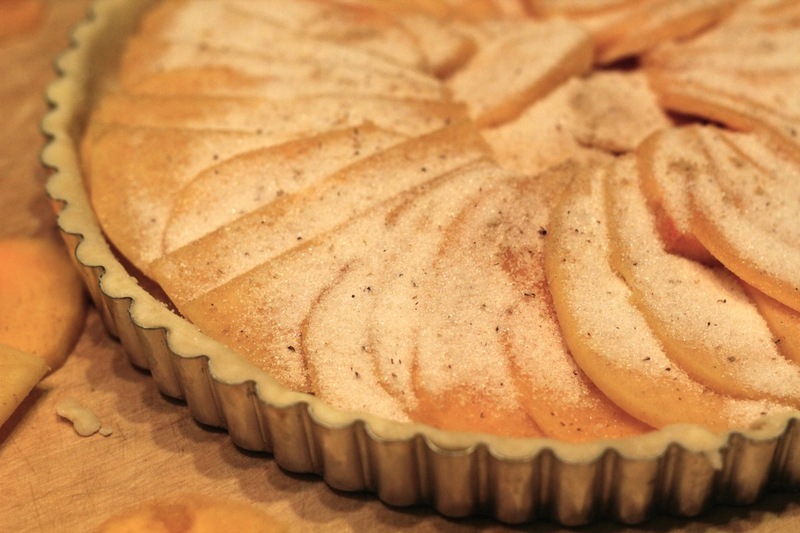 Assemble tart: Preheat oven to 375˚F. On a lightly floured surface, roll out dough into a 13-inch round and fit into a 10-inch tart tin. 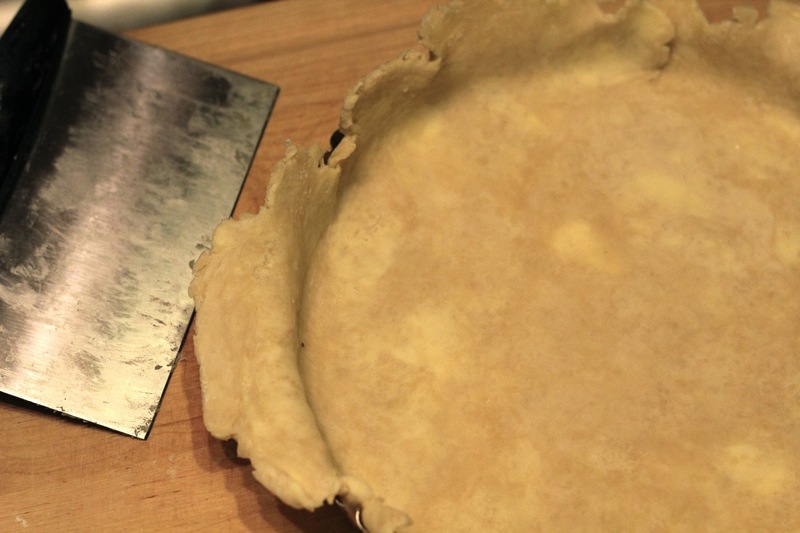 Press dough into corners and then guide your rolling pin across the edges of the tart pan to trim the excess dough. 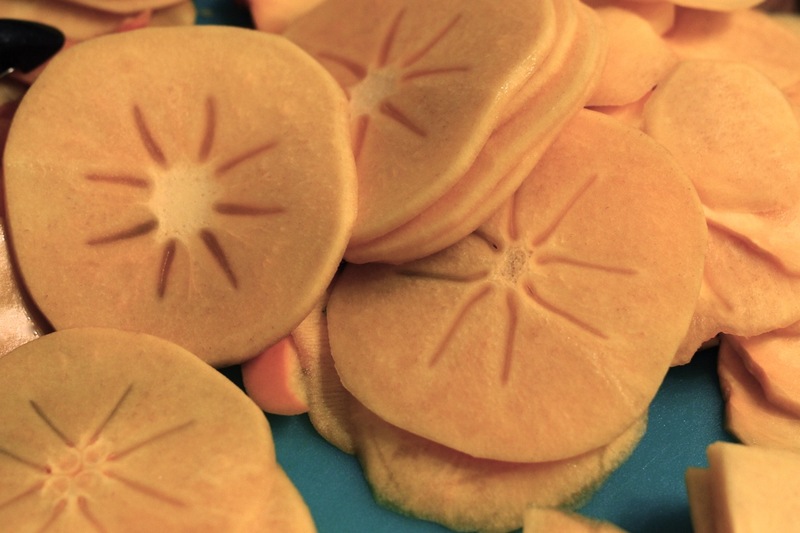 Arrange persimmon slices in the pastry shell. Mix together sugar, nutmeg and ginger and sprinkle on top of the fruit. 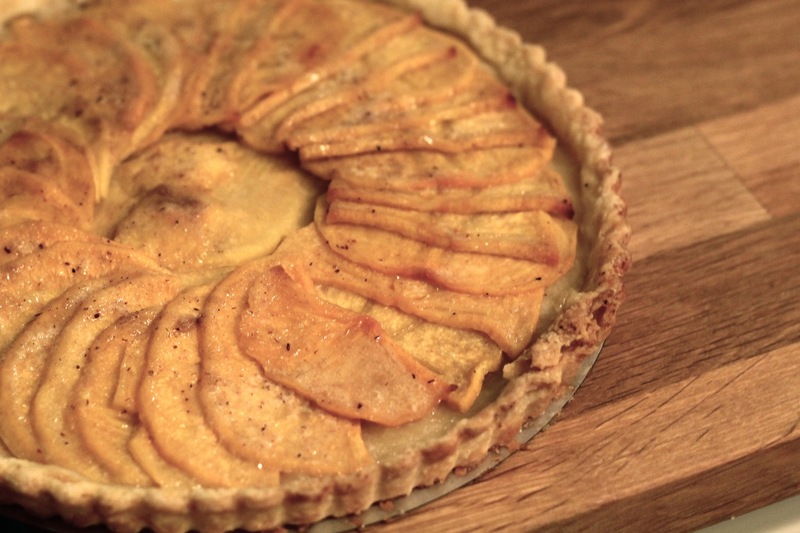 Top with butter slices and bake for 45 minutes, or until the crust is golden and the persimmons are lightly browned. Serve alone or with whipped cream. Tart keeps for a few days in the fridge, although the one pictured here didn’t last 15 minutes. Oh, this looks lovely! For the past several years my family has observed Christmas with the Persimmon Pudding in the old Joy of Cooking (it may be in the new one, but I don’t know), topped with Hard Sauce. It is worth a try if you want to experiment further, particularly if you own a food mill, which makes it easier. Mmm, that sounds good – I’ll have to give it a try sometime! I know what you mean about preserving the sanctity of Thanksgiving but it sounds like you made a wise choice in allowing a tiny bit of Christmas to sneak into your life before December! Your tart looks yummy. If only they made thanksgiving music I could have been festive AND properly observed November’s awesomeness.